The Ministry of Health and Prevention on Monday unveiled a plan to build the first Emirates Space Hospital to treat astronauts using nanotechnology. The announcement was made at the Arab Health 2018 where the ministry also unveiled innovative health care initiatives to treat chronic diseases, including cancer, cardio vascular, diabetes and depression. 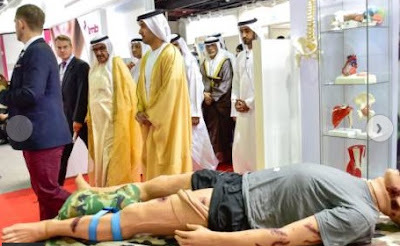 The four-day biggest health care exhibition of the Middle East was inaugurated by Shaikh Hamdan Bin Rashid Al Maktoum, Deputy Ruler of Dubai and Minister of Finance. Dr Kaltoom Mohammad Al Beloushi, Director of Hospitals Department at the ministry said all the new innovations were announced in tandem with the Vision 2021, Artificial Intelligence and National Space Programme and Fourth Industrial Revolution initiatives.